A bold, broad style, with gorgeous green fig, pear and melon favors laced with heather honey and glazed peach on the rich finish. Extra persimmon, hazelnut and brioches notes fill in the background, giving added dramatic effect. 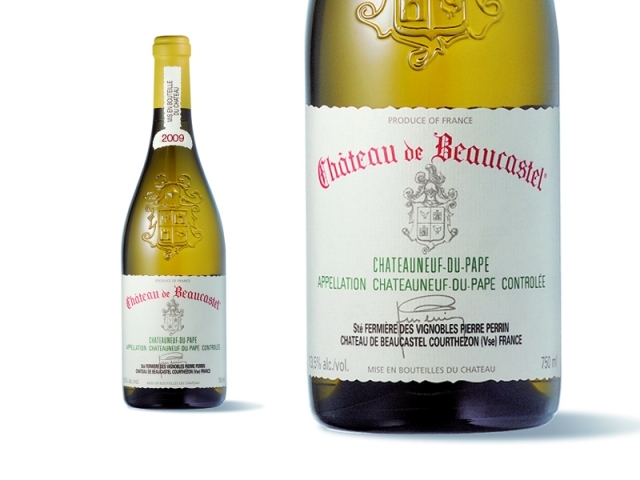 The 2009 Châteauneuf-du-Pape Blanc is an amazingly open-knit, full-bodied, honeyed white boasting tons of orange marmalade, quince, white currant and crême brûlée liqueur-like notes, stunning purity and richness, and a fabulous full-bodied, unctuously textured mouthfeel. Its richness is off the charts, and the wine offers a completely contrasting style with the more delineated, zesty 2010. Le Beaucastel Blanc 2009 sent l'ananas confit; c'est doux, très plein en bouche. Un bon classique indémodable. 80% Rousssanne with small amounts of Grenache Blanc, Picardan, Bourboulenc and Clairette. 20% fermented in small oak barrels. Gently aromatic, a herbal note but nothing in the least herbaceous. Almonds and a delicate note of pear and honey. Full bodied, pears and just-ripe apricots but quite restrained and highly structured at the moment though there is a creamy texture not apparent in the Coudoulet. Really quite a grip but no bitterness of phenolics. Such a baby and yet it is harmonious and the depth is there already and then a stony mineral aftertaste. Light gold. Richer and more pungent than the 2010 version, offering an array of floral, orchard fruit and spice scents and a hint of candied ginger. Fleshy and expansive, with very good depth to its pear, peach and honeydew flavors. A note of iodine adds an exotic touch to the long, sappy finish. A bold, broad style, with gorgeous green fig, pear and melon flavors laced with heather honey and glazed peach notes on the rich finish. Extra persimmon, hazelnut and brioche notes fill in the background, giving added dramatic effect.